with great number of ready-to-use vector stencils of machines, equipment for transporting, hauling, distributing manufactured goods, materials, cargo, stock from plants and industrial facilities, etc. 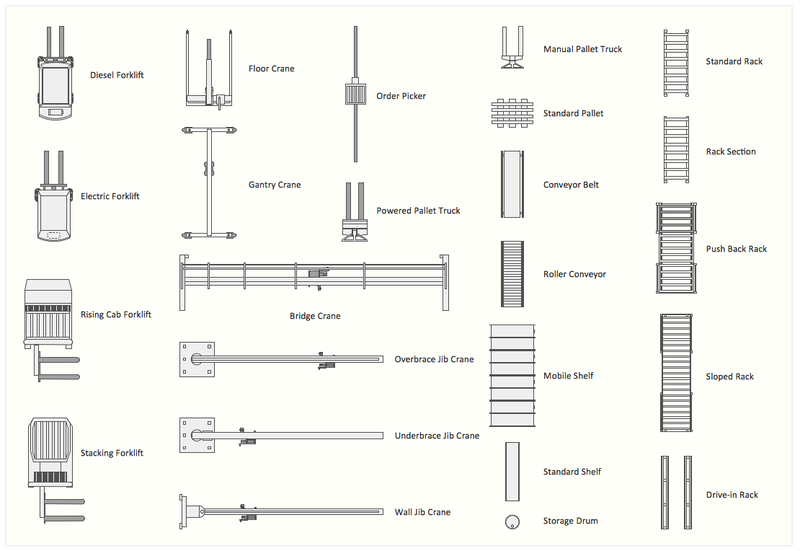 Storage Design Diagrams helps effectively and functionally organize the storage area. The correct storage design enhances the effectiveness of work of the industrial plant. It's very convenient, easy and quick to develop storage layouts of manufactured goods using the Storage and Distribution library from Plant Layout Plans solution from the Building Plans Area of ConceptDraw Solution Park. Storage and Distribution library of Plant Layout Plans solution contains 24 predesigned vector objects. 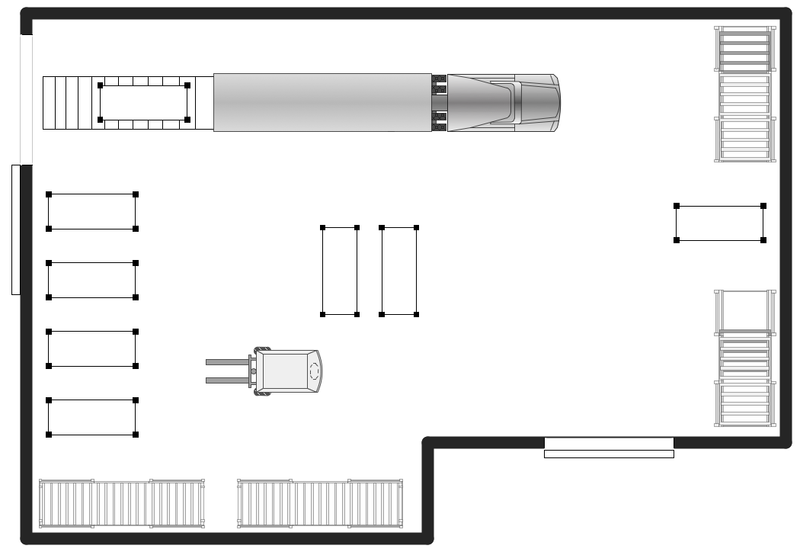 The Storage Floor Plans created with ConceptDraw DIAGRAM are vector graphic documents and are available for reviewing, modifying, and converting to a variety of formats (image, HTML, PDF file, MS PowerPoint Presentation, Adobe Flash or MS Visio). Talking about interior design, we usually mean apartments, houses or establishments. But there’s much more to this, for instance, interiors in warehouses, storage and distribution departments and machine shops also require designing. You can find all the necessary design elements such as cranes and forklifts in Plant Layout Plans solution ConceptDraw Solution Park. This picture represents content of the Storage and Distribution library, providing the collection of vector images designed to plan layouts of industrial storage facilities (warehouses). Warehouse is a premises and equipment intended for the reception, distribution and storage of products manufactured at the plant, as well as to preparation the product for shipment to the consumer. This vector images library is supplied with ConceptDraw Plant Layout Plans solution. it will help to industrial architects and planners to design plans for industrial storage and shipping facilities. 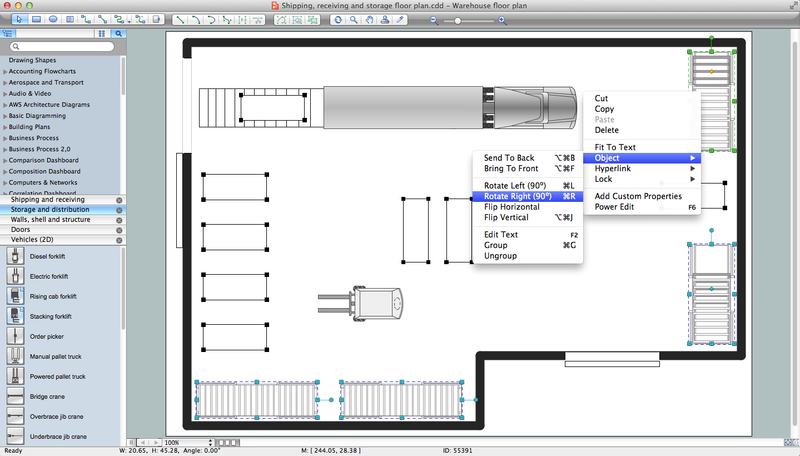 Storage layout plan software offers self storage building plans for all sizes of storage construction.